Another bit of a stretch, but here is today’s letter: Khaleesi, a term used to refer to the wife of the Khal, the warlord of a tribe of Dothraki. In other words, Daenerys Targaryen. Well I had to get a Game of Thrones post in here somewhere, didn’t I? I have not yet sat down to watch the TV series end to end, but I am reading my way through the books and the parts of the TV series that I have seen are amazing. 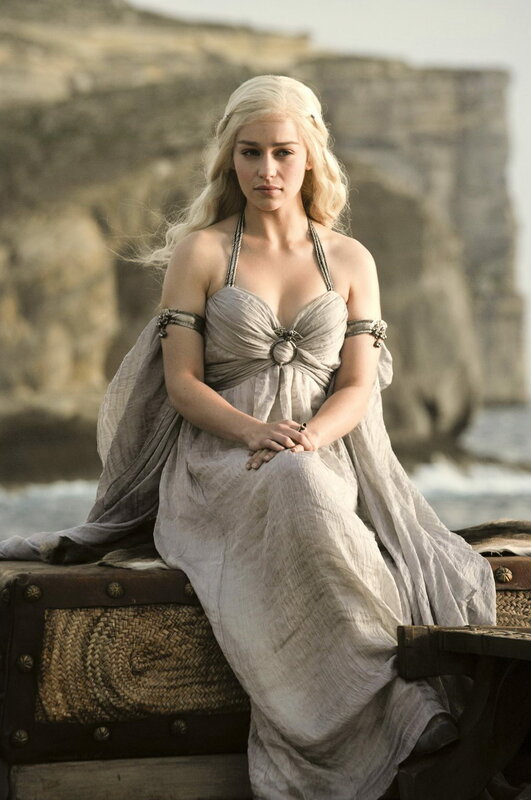 The actress they have for Daenerys is gorgeous. If you haven’t read or watched any of this, then I will warn you that there are going to be some spoilers in here. Mainly they will cover book one, and perhaps a little of book two, but there will be spoilers, and they will all relate to Daenerys and her dragons. Daenerys was born during a raging storm, earning her not only her house name, but the name Stormborn. Her and her brother, Viserys, are the last of their line, having had the rest of the house of Targaryen killed in a blood bath just after she was born, in a successful attempt to take the Iron Throne from them. The two of them fled overseas to the free cities to keep them alive, otherwise the new king would have had them killed like the rest of their family. This becomes the focus of Viserys life, to go back across the sea and take the Iron Throne which would have been his birthright. In order to make alliances to this, he marries off his sister to the strongest Dothraki warlord, in the hopes of getting his army to march with him. And that’s how Daenerys ends up being married to Khal Drogo, even though she does not want to. 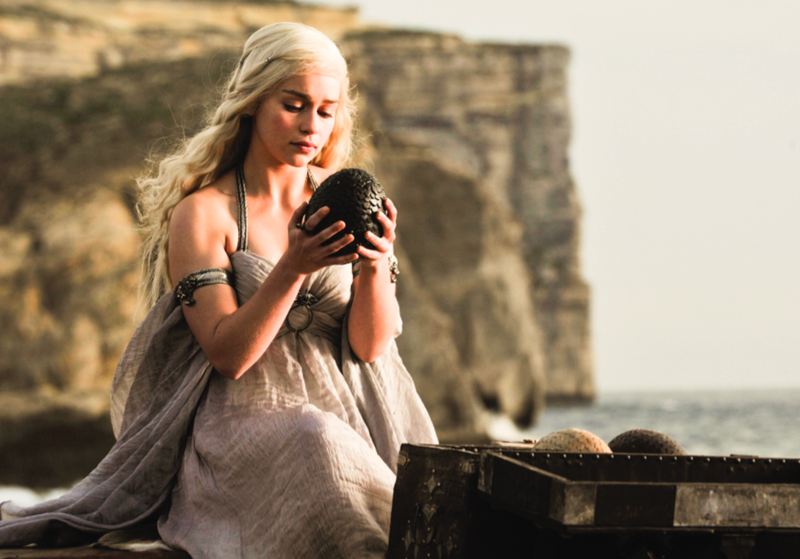 At her wedding she receives a number of gifts, including three dragon eggs, but of course they are not real dragon eggs, they are petrified, never to hatch, but they make a nice gift, especially from one of the house of dragons. Stuff happens, time passes (lots of human things, but I don’t want to spoil everything so I’m just concentrating on the dragons) and eventually Khal Drogo dies of an infected wound. 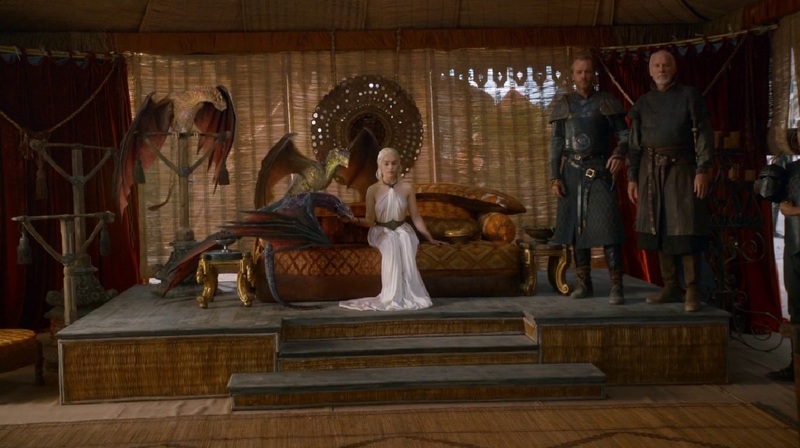 On his funeral pyre, Daenerys lays her three stone eggs, and then after a speech to the remains of the dothraki army, she steps into the fire herself. However, since she is a true dragon of the blood, she is not kills, and the next morning, out of the embers, she steps with three newly hatched dragons clinging to her, the first live dragons in over a century and a half. 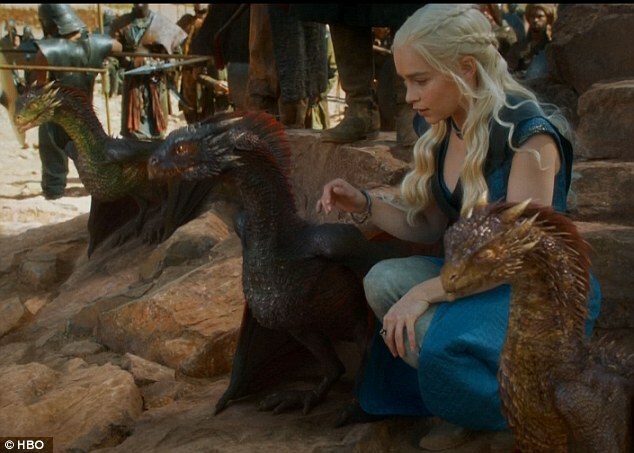 She names these dragons Daenerys names the three dragons Viserion, Rhaegal and Drogon, after her two deceased brothers and her late husband, respectively. If I could be her, I so would be. Even with all the bad stuff, she is so awesome and cool and I haven’t even read to the end of the series yet (I’m on Feast of Crows, it’s hard going!). But she is called the Mother of Dragons, amoung her many other titles, and is totally badass. Awesome pics! I hadn’t seen the dragons yet (only watched the first season, but have read the first 4 books). Thanks for posting those! No problem, a quick google search turns up these and more 🙂 But yeah, I should get around to watching the series, but the books are so much further ahead. Does mean I have to watch what I say around my housemates though, because they watch the series and I have some really juicy spoliers! Did you hear about the high school teacher who threatened to write spoilers on the wall if the class didn’t behave? SO funny! My favourite thing about the GoT series is that it will put some pressure on GRRM to finally finish writing the series instead of procrastinating ad nauseum. 11 years between books three and five, seriously? Although most of the guys I know like Dany for entirely wrong reasons, I really like how she gradually turns from a diminutive girl who has no control over what’s happening to her into a woman with real strength, wisdom, and conviction that what she does is right. Once again I found myself reading about a topic that until recently meant nothing to me. I’ve never read, seen or had the desire to see any of the books or series. 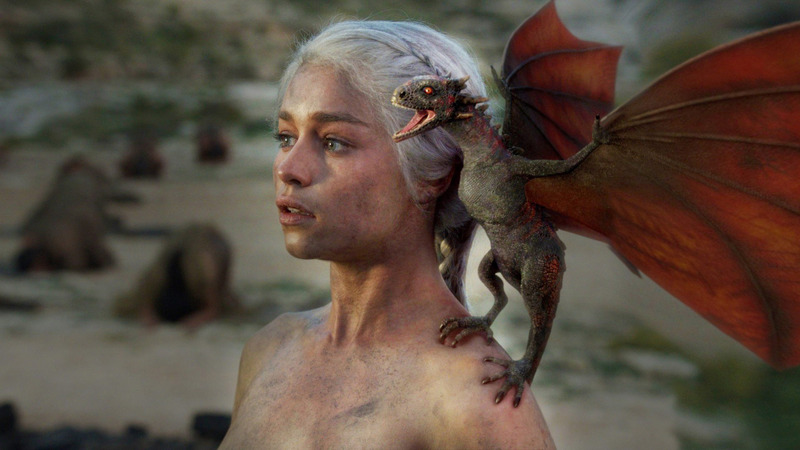 Having said that, the Mother of Dragons is a rather beautiful young creature. That does sound pretty entertaining. I don’t know how thrilled I would be if someone named their dragon after me though. That might be the medieval equivalent of someone naming their dog after you. On the one hand, it’s kind of an honor, but on the other other hand it’s downright insulting. 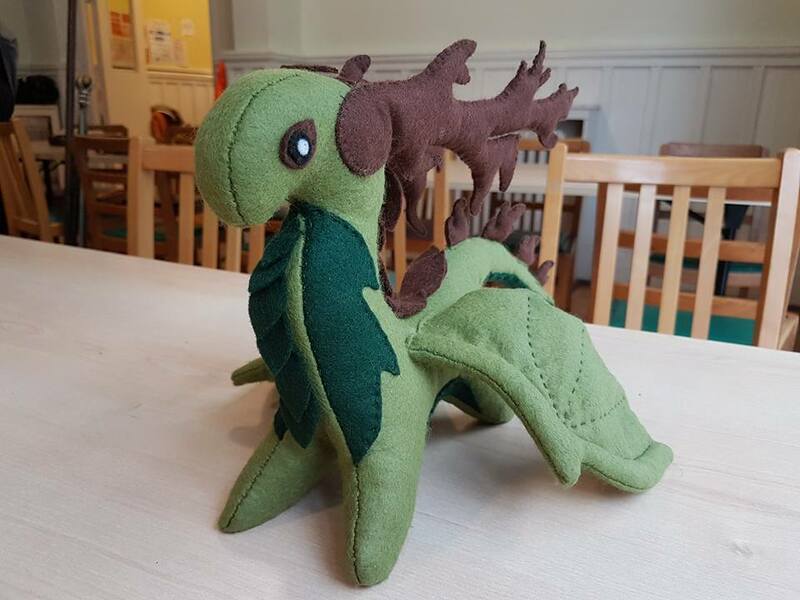 If I had a pet dragon, by the way, the first thing I would do would be to fly it downtown and perch it on top of the Arch during afternoon rush hour. That would definitely get the highway commuters to stop texting while driving.